On the other hand, thirty years on, this romantic hippie ideal is looking just the tiniest bit shopworn, and the movie can never quite shake off its own sense of shame for still celebrating it to the extent that it does. So the celebration is grafted onto a pretentious meditation on tourism, of all things, and the paradox by which the best places to travel to are invariably spoiled by too many tourists—who come because they are the best places to travel to. Well, I guess everybody has his problems and every human problem its literary or cinematic expression (if not resolution), but in the larger scheme of things, this one hardly seems to me to be one to engage the attention at the highest level. 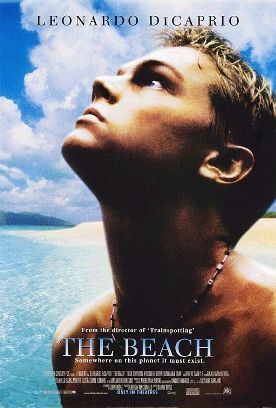 The story is told mainly in voiceover by a young American tourist called Richard (Leonardo DiCaprio) who is looking for new and exciting experiences but has somehow fetched up in Bangkok where, in defiance of all the legends, the most exciting thing to do seems to be drinking snake blood. There, living in a seedy hotel next to a young French couple, Étienne (Guillaume Canet) and Françoise (Virginie Ledoyen) he encounters a filthy bum called Daffy (Robert Carlyle) who has obviously fried his brains on drugs. Daffy babbles about a mysterious, paradisal beach that no one else knows about. Richard does not take him seriously, but almost immediately Daffy kills himself, leaving behind a map. Always game for something new, Richard proposes to the French couple that they go together to find The Beach, using Daffy's map. Richard's voiceovers keep insisting, as the movie itself is unable to do, on the significance of their journey to the Thai coast—“To get there you had to go to the usual tourist places” he says scornfully, though himself indistinguishable from a usual tourist. “You hope and you dream but you never believe that something's going to happen for you, not like it does in the movies...When it does you want it to be different, to feel more visceral, more real,” he tells us. As nothing that we have seen so far feels either visceral or real, he is reduced to more talking about it, either to us or to the French couple: “Everybody tries to do something different, but you always end up doing the same damn thing.” The same could be said about the movie. Their swimming for between one and two kilometers through shark infested waters to the island on the map appears to be something different, if only because it never occurs to them to go by boat, but it turns out that lots of other people have had the same idea. Too many. Up until now the hippie colony on one side of the island has lived in peace with the drug lord who farms marijuana on the other side, but the drug lord wants no more hippies coming in and threatens to throw them all out if news of the place attracts any more. Richard and his French friends appear to be the last ones admitted. Sal becomes fanatical about keeping all news of the place or its location from circulating on the mainland. But Richard left a copy of Daffy's map with a couple of surfers. . .
And still, the voiceovers relentlessly continue. “For a while,” says Richard in a spirit of elegy, “we were untouchable in our happiness.” But a shark attack, the discovery of Richard's duplicate map, and finally the drug lord's machine-gunning of a few would-be immigrants put an end to that. There is a brief episode in which the authors appear to want to do a Lord of the Flies bit. Richard, exiled from the community for his sin in leaving the map, briefly turns feral and savage. But somehow it doesn't come off. Perhaps, as we can tell from his frequent recourse to his by-now familiar, “I'm-the-king-of-the-world” Yahoo-howl, he is already a savage to begin with. In any case he has to be left sufficiently compos mentis in the end to continue doing his everlasting voiceovers. Actually, the voiceovers, like the hippy colony and the movie itself, finally do come to an end. In the last of them, Richard tells us that the beauteous Françoise, “like others, was smarter before she went to the island.” Here, at least, we know what he means, as it is hard to escape the impression that we were smarter before we went to this movie.